Over the next few minutes, the helicopter circles a short distance away from the bear waiting for the anesthesia to take effect. The bear slows to a walk. He stumbles over a block of ice. His back legs give out, but he lurches to his feet once more. A few steps later the dazed animal drops in slow motion, falling flat out on the ice, limp and unmoving, eyes open in an unseeing stare. The pilot lands the helicopter and the scientists begin their work. They measure the bear’s height, girth, and weight. They take samples of blood, hair, feces, fat, and fur. A unique identification number is tattooed on the bear’s gums and a tag attached to his ear. The scientists work quickly—they have only about an hour before the bear regains consciousness. Maybe there’s time to “shoot” another polar bear or two before the long spring day turns to midnight dusk. Then it’s back to the lab to enter the day’s findings into the computerized databases for further study. And so goes the life of the polar bear scientists, a dedicated team of individuals who work with the U.S. Coast Guard Polar Bear Research Project. During the two months of late spring, the scientists capture and tag 70 to 100 polar bears. Following the bears and analyzing the massive amount of accumulated data allows the scientists to assess the bears’ individual and collective health. The U.S. has been studying polar bears since the late 1960s. Polar bears are an international species, and all the nations that border the Arctic—the U.S., Soviet Union, Canada, Demark, and Norway—share the research and management of the estimated 20,000 to 25,000 remaining wild polar bears. It’s important work. While these powerful animals are at the top of their food chain, their continued existence is threatened by a decline in their habitat due to climate change. 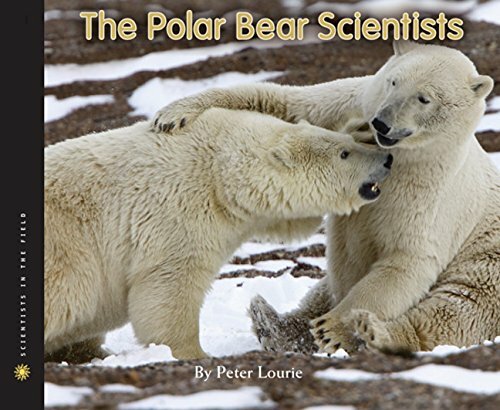 In The Polar Bear Scientists, author Peter Lourie makes a fascinating and compelling case for the importance of studying polar bears. For they are the apex predators of the Arctic—the gigantic white canaries in the mines that tell us something is not right with their world. Warmer weather means less sea ice, and polar bears are most effective at catching seals from the surface of the sea ice. Bears are fewer; they are thinner; some even drown at sea searching for an ice flow strong enough to support their weight. The Polar Bear Scientists is the newest entry in the publisher’s outstanding series, Scientists in the Field. In these books, authors spend time in the field with scientists working in a variety of environments. The scientific details in The Polar Bear Scientists are clear and concise, making the complex concepts more easily understood. The book closes with an excellent polar bear field guide and a list of resources. Young readers might have appreciated a section telling them what they could do to support polar bears and their habitat. The photographs of the scientists at work and the bears in action are exceptional; however, the images of grinning scientists cradling anesthetized cubs with vacant eyes are a bit unnerving, reminiscent of the photos of yesteryear in which hunters proudly posed with their kills. One of the more interesting topics is too-briefly explored. The Inupiat people of the Arctic harvest bowhead whales for sustenance each fall. The people pile the whale carcasses outside their villages. Local polar bears gather in large numbers at these bone piles to forage for much needed bits of meat, fat, and cartilage when the sea ice retreats north. The image of the bears huddled among the whale bones is sobering. What does it say about how we’ve managed our world when one of Earth’s most magnificent predators is reduced to scavenging scraps for survival?